Residential Door Hinges are lighter-weight; perfect for everyday applications. Commercial Hinges on the other hand, have a thicker, sturdier design; an absolute must for heavy-duty applications. Spring Hinges are self-closing, great for exterior and garage doors -- especially if you have small children or pets. Ball Bearing Hinges are much smoother and quieter, and provide much better wear; recommended for high-traffic and solid core doors. And finally, we have a growing selection of Specialty Hinges for all those hard-to-find applications. Just select a door hinge category below to get started. For more help determining which kind of hinge you need, see door hinge ordering help at the bottom if this page. All hinges are shipped complete with mounting screws, but if you need a few more, we've got you covered! Not sure what type of door hinge to get? For most applications a residential grade door hinge will be sufficient for what you need. 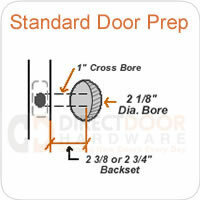 If you have solid wood doors- or just taller heavier doors - you will probably want to go with a heavy duty door hinge. Something else to consider is the location. Solid brass door hinges may hold up better for exterior applications than a steel door hinge would (in coastal regions especially). We sell both kinds of hinges and many variations so we should have what you need. Besides the material they are made of, there are three basic styles of door hinges, square corner, 1/4" radius corner, and 5/8" radius corner. You'll want to be sure to order the correct type to replace what you have. If you have square corner hinges, it's pretty easy to figure out that you need square corner hinges to replace them. Radius corner door hinges are sometimes a little more difficult to know what you have, so we have a simple test below to help you determine what you need. 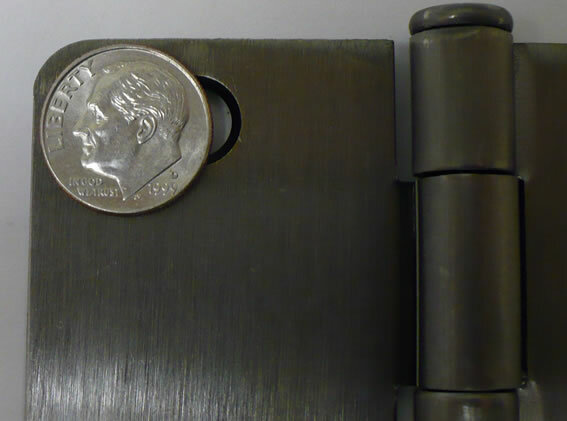 If you hold up a dime in the corner of the door hinge as shown to the left and the radius is just smaller than the dime, this is a 1/4" round corner door hinge. If it is larger, try the next step. 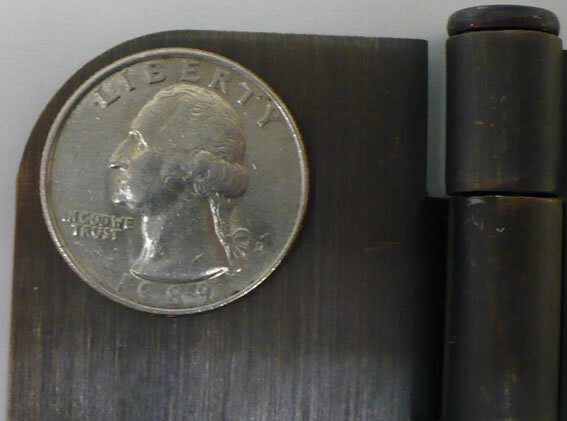 If you hold up a quarter in the corner of the door hinge and the radius is pretty much the same as the quarter, you have a 5/8" radius corner door hinge. Order the same to replace it. If the radius is smaller, you probably have 1/4" radius corners. It is true, a 5/8" radius hinge will operate a door exactly the same as a square corner hinge. However, as you will notice in the picture to the left, it just doesn't look good. If you are going to all the work to replace door hinges on a door, you may as well get the correct door hinge the first time. Probably the easiest way to replace the hinges on an existing door is to leave the door hung on the jamb(frame). Start at the top and remove the first hinge on both the door and the door jamb. Install the new door hinge in it's place. Do the same on the middle and bottom hinge. If you remove the door and remove all hinges and then replace them while it is not hung, it will be much more difficult to get the job done and harder to get all the hinges to align and work properly. If you are replacing a house full of hinges to get rid of the old brass or painted over hinges, you'll want to consider using a cordless drill with a screwdriver tip. At 6 screws per hinge (some more) and 2-3 hinges per door... your wrist will be mighty tired by the time you are done replacing them all. Replacing hinges is not hard to do at all, just a little time consuming. But, the end result is a much better looking home when the door hinges match the door hardware. 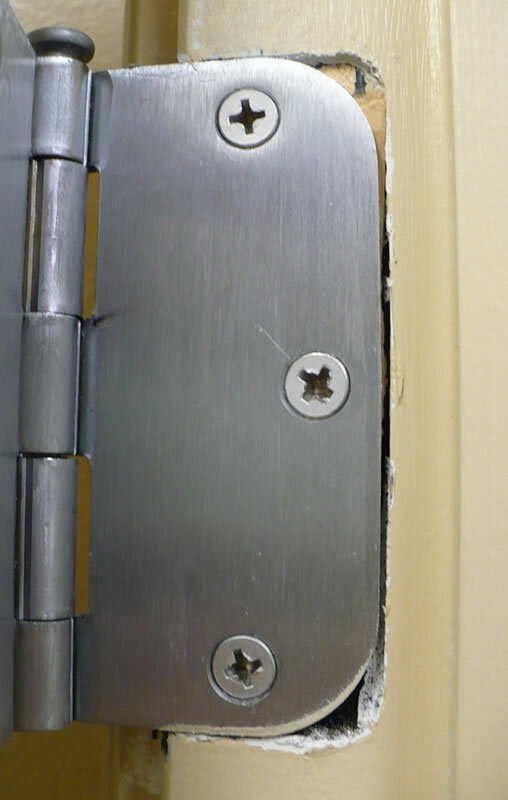 Replacing your door hinges is easy to do and can be done with just a screw driver. Upgrading your old door hinges can help your door operate smoothly, but can also give your home an upgraded look. Something as simple as coordinating your door hinges with the door knob on your door can make a big improvement.